Summer is finally here! Delicious pineapples are one of my favorite things about summer. Now you can have pineapples in your mouth AND on all your stuff! 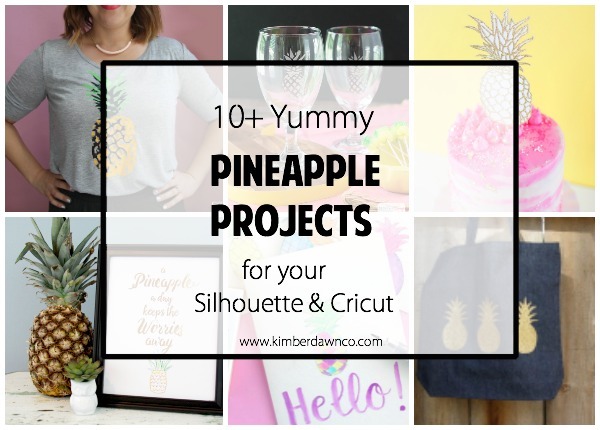 Here are some yummy pineapple projects for you to sink your crafting teeth into! I love to make fancy water with some fruit in it. These glasses would be perfect for a little pineapple mint flavored water am I right? Coral and gold foil? I am sold! I just adore this super cute tote bag! My mother in law has pineapples everywhere because in the south they are a symbol of welcome. She would absolutely love having this sign in her entry way! Stamp pineapples on EVERYTHING!!! This stamp means I can have a pineapple anywhere I want it in seconds! Perfect! This is such a cute saying. And I love that it has some stitching on it to give it a custom feel. These would make amazing centerpieces. I love the layered 3d effect. So cute! The simplicity of this sign makes it perfect! It is not busy and cluttered, just one adorable pineapple. How fun would it be to throw this pineapple on a loose tee and throw it over your bathing suit while you sit at the pool drinking pina coladas? This is a really fun sign. I don’t understand the psych reference but it is adorable all the same. I can’t even…How cute is this cake topper? It would also be adorable on cupcakes or blown up as a centerpiece for a pineapple table scape. I can’t lie, I have about 1000 tote bags. I am obsessed with them. This is one that will definitely have to go into my collection of bags! So cute! What is your favorite pineapple project?